February will go down as the worst month of volatility for stock markets in many years and the largest drop since early 2016. The indices had a mixed day in choppy trading, recovering from selloff into the close yesterday following Jerome Powell’s speech. While the markets may have perceived Mr Powell’s inaugural address to Congress as hawkish, he said nothing that wasn’t warranted, and the reality is that the cost of money has to go up with the economic recovery. Financial markets are going to have to accept this new reality and acclimatize to a higher interest rate environment. While market continued to digest the Fed Chairman’s address, some relatively soft economic data may have alleviated and offset near term concerns. I still believe the Fed will hike rates four times this year (rather than three already flagged to the market) but is this view is not consensus yet with only a smaller probability priced in to the US yield curve. 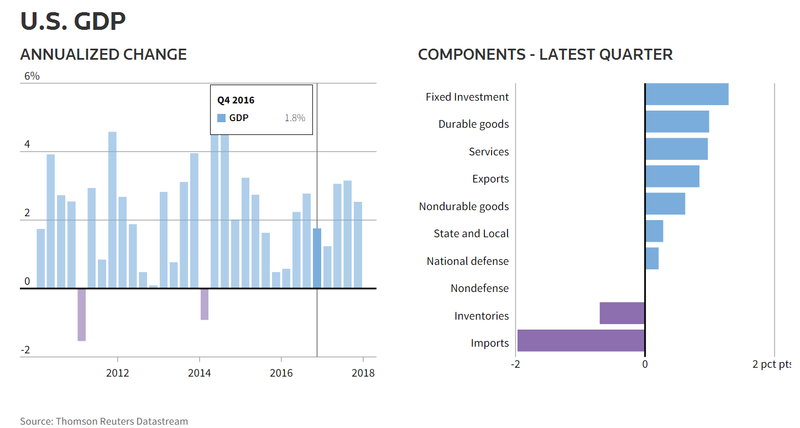 Revised data from the Commerce Department showed GDP climbing 2.5% in 4Q17, which was down from the earlier figure of 2.6%. This was primarily due to a downward revision to private inventory investment. 4Q17 growth was notably slower than the 3.2% figure recorded in the third quarter. The downward revision to the fourth-quarter growth estimate was largely reflected in a smaller inventory build than previously reported. One Economist interviewed on Reuters made the point that “an economy that is at or beyond full employment cannot match this pace of demand growth and, therefore, must either sell from inventory and/or purchase from abroad”. This points to growing imports and a widening trade deficit later in the year. The downward revision in GDP did not stop the US Dollar rallying on the news with the DXY pushing back up to 90.7. Pending home sales in the US posted an unexpectedly steep drop in January according to the National Association of Realtors. The pending home sales index fell 4.7% to 104.6, from a downwardly revised 109.8 in December. It was a significant miss as economists had expected pending home sales to edge up 0.3%. While this has impacted near term thinking, the main game for the Fed is going to be the closely watched CPI and wage growth figures due out later in the month, which will have a significant bearing on the markets. Trading was light on the final session for February with the Dow, S&P500, and Nasdaq, losing 1.5%, 1.1% and 0.8% respectively on Wednesday. The S&P500 lost 3.9% in the month, the biggest decline since 2016. With the correction coming early this year (and albeit sharply in February), March through to April could be a positive period for the markets with a strong earnings reporting season now concluded, although the lead is likely to come from the bond market. Ten-year Treasury yields held just below 2.9% – which is elevated compared to the beginning of the year and the highest since 2014. 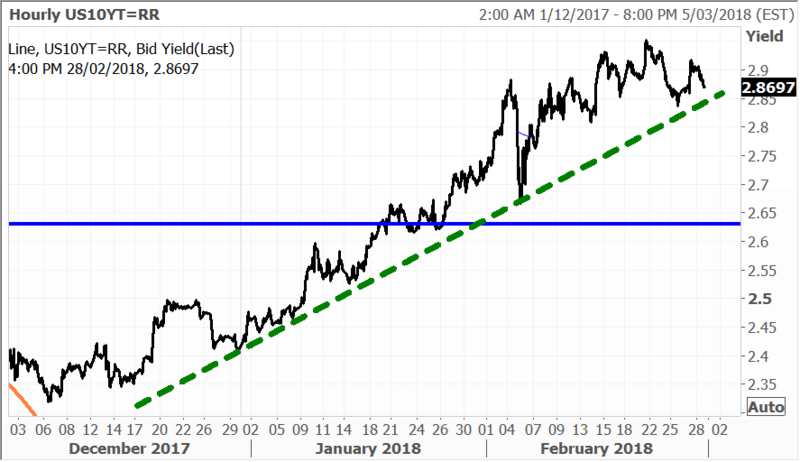 The ten-year yield also successfully tested a corrective spike lower to 2.7% so we are adhering to a view that yields are going higher, and sooner or later, the 3% level is going to give way on the upside. Turning to Europe the benchmark Stoxx 600 declined 0.71% for the day, with most markets and sectors below water. German-listed Bayer slipped 1.9% as profit dropped due to discounts to crop protection distributors in Brazil and said it needed longer to finalise its planned takeover of Monsanto. Belgium-listed chemicals giant Solvay dropped 3.5% after announcing a soft outlook and a fall in profitability in its traditional chemicals business. On the other side of the coin, German-listed Dialog Semiconductor surged 6.6% after issuing positively received results. Also bucking the downward trend on the day was travel technology company Amadeus IT Group, Heidelberg Cement and elevator company Kone rose 0.9%, 0.6% and 0.7% respectively. Heidelberg Cement is held in the Global Contrarian Fund, while Amadeus and Kone are held in the managed account portfolios. The FTSE 100 dipped 0.69% Wednesday on the back of what was interpreted as hawkish comments from Fed Chairman Jerome Powell and weak economic data from Japan, China and in Europe. Declining oil prices also weighed on sentiment. Miners were also lower on the day, with the likes of Randgold Resources declining 1.7%, BHP Billiton down 2.2% and Glencore slipping 2.4%. Randgold and BHP are held in the managed account portfolios, while Glencore is recommended by the research team. The Nikkei slid 1.44% after the Bank of Japan’s decision to trim purchases of super long dated government bonds boosted the yen and various other releases disappointed investors. Industrial production fell 6.6% month-on-month in January, compared to the 4.2% decrease expected. It was a reversal from the 2.9% growth logged in December. In addition, housing starts slumped 13.2% year-on-year in January, much more than the 4.7% decrease forecast. Retail sales were down 1.8% month-on-month, falling more than the 0.6% expected. In terms of stock movers, amid the sea of red, Sony shares managed to barely stay above water with a 0.06% gain. On the other side of the coin, energy company Inpex fell 4.9% as oil prices declined for a second day. Both Sony and Inpex are held in the Global Contrarian Fund. The Shanghai Composite declined 0.99%, as the manufacturing PMI reading came in at 50.3 in January, below the forecast 51.1 and slipping from 51.3 in January. Non-manufacturing PMI eased to 54.4, again below the forecast 55.0 and down from 55.3 in December. The Hang Seng slumped 1.36%, for its biggest monthly fall in two years. The IT sector was a laggard in Hong Kong, as was the property sector. A 3.1% fall in index heavyweight Tencent Holdings dragged on the broader index. It is held in the Global Opportunities managed account portfolios. The Macau casino operators held up relatively well, with Sands China down 0.8%, while MGM China was flat and Wynn Macau gained 1.1%. Visitation and spending trends to Macau have been positive. Sands, MGM and Wynn are held in the Global Contrarian Fund. The market in Australia ended February on a soft note, with the ASX200 closing 40 points lower at 6,016. The 6,000-mark held though, and in what was a volatile start, the index retreated just 0.4% in the month which much better than most other stock markets. This is clear evidence of the Australian stock market decoupling from the US which as a trend is set continue this year. 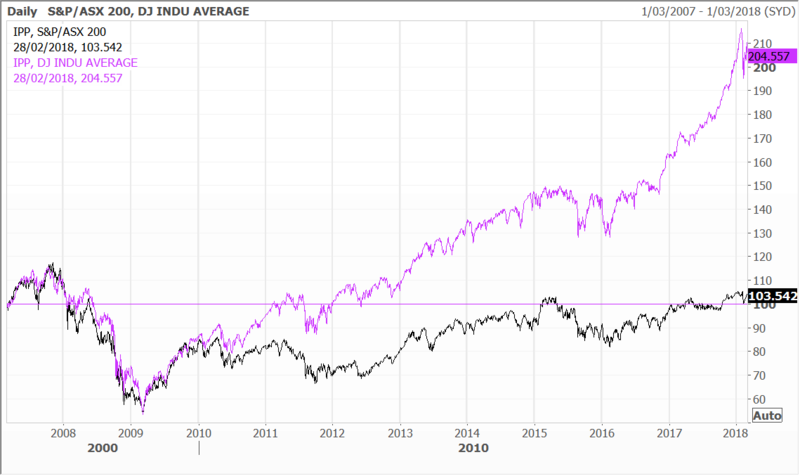 The ASX200 has not been nearly as overextended on the upside (and is still 1,000 points below the 2007 peak), underperforming from a long term perspective the US indices in particular. Qantas was flying higher again yesterday, up another 3.3%, and as investors continue to warm to the company’s knock out result. Greg Smith covered the analyst team’s view on the airline at yesterday’s Members’ webinar. Fairfax, Silver Chef, QBE, and Ardent Leisure are also topics of discussion. We hold all four stocks in the managed account portfolios. Fairfax and QBE remain high conviction buys from the analyst team’s perspective. Baidu’s video streaming unit, iQiyi, sometimes called the Netflix of China has filed for an IPO in the United States. In the filing, Baidu said it intends to list iQiyi on the Nasdaq exchange and is seeking to raise around $1.5 billion. The funds raised will take some of the burden off parent Baidu, as the unit is still loss-making. Baidu management told investors that the company intends to remain iQiyi’s controlling shareholder. The video streaming business has more than 50 million paid subscribers, but lost RMB 3.7 billion in 2017 due to high content costs and intense competition. The opportunity is big though, with the company citing a report from iResearch Consulting Group estimating the market is expected to grow from RMB 51 billion in 2012 to RMB 688 billion ($109b) by 2022. Baidu is a leader in the field of artificial intelligence (AI) and the filing reportedly emphasised this was an edge for iQiyi, stating that “We distinguish ourselves in the online entertainment industry by our leading technology platform powered by advanced AI, big data analytics and other core proprietary technologies.” The idea is that the technology can better cater to users tastes and help executives allocate capital to deliver a superior product for customers. Baidu is a holding in the Global Contrarian Fund. 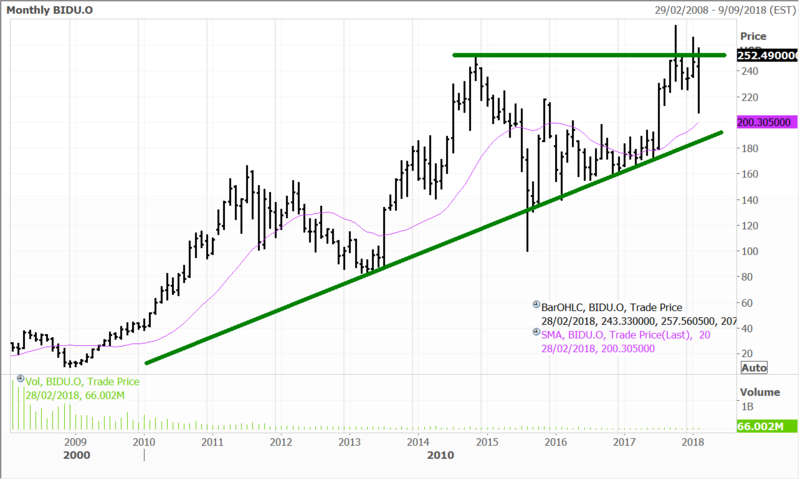 Disclosure: The Fat Prophets Global Contrarian Fund declares a holding in: Baidu, Heidelberg Cement, BHP Billiton, Sony, Inpex, Wynn Macau, MGM China, Sands China, Fairfax and QBE. Next PostNext Have you got my back?